This weekend, I’ve been perusing the car lots. I’ve hit the local Ford, Chevrolet and Jeep dealerships. 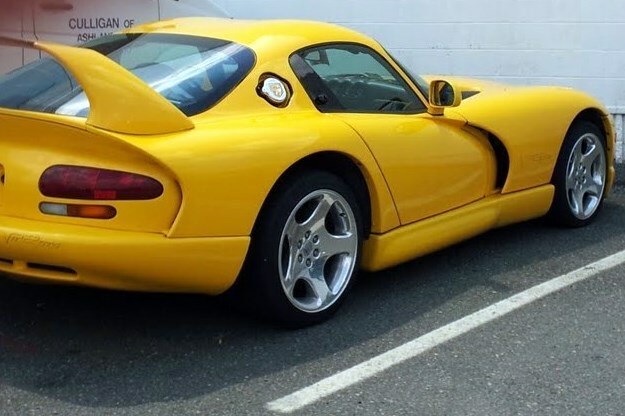 No, I am not looking to purchase a Viper, I just found it entertaining that the Dodge/Jeep dealership actually had one and it was owned by someone there. Anyway, since I’ve been looking at cars, I’ve realized that car shopping is not as fun as I thought it would be. It really boils down to one issue and that’s ageism. I’m someone who looks much younger than I actually am. At work, when I have to cover something at one of the schools, I’m often mistaken for a student, both middle and high school. Some people would say that’s a good thing and not really a problem at all, but it actually is. I first really ran into it when I purchased my wedding dress. The manager of the store was incredibly rude to me and treated me as if I was a child bride. How awful. I’m in your store, willing to spend hard-earned money on your product and you can’t treat me with any type of respect because you’re judging me based on my appearance. I can’t control how young I look and it’s not fair that I should be punished for that. One should never judge a book by its cover. At the Ford dealership, I ran into ageism again along with sexism. The man treated me as if I was stupid and didn’t know anything. He called me “sweetie” and “dear” and wouldn’t talk to me, but rather to Ron. I’m the one who is going to be driving this. It’s going to be primarily my car. Talk to me. He told me basically I couldn’t afford anything over $15,000, which is both incredibly stupid and wrong, and I was mistaken in my research (no he didn’t say it that nice) and the competition car had a starting price of $30,000. Funny how I went right next door to Chevrolet, found an amazing, helpful, incredible salesman who not only showed me the Equinox, but also explained everything about it and gave me a price of $25,000 which he said they would definitely be willing to work on. He also looked to see what would be arriving in the future and found me one at $24,000, which again could be worked with. Now, I’m much more likely to purchase the Chevrolet from this salesman than the Ford from the other salesman, or really any salesman at all. I guess he didn’t realize that not only is he representing a dealership, but he is also representing the brand as a whole. That’s a shame, especially in this economy when American cars are struggling. I want to support my country’s economy and my local economy, but that doesn’t mean I won’t go elsewhere if I’m not treated well. Then today, I went to check out the Jeep Compass. Nice car, but the salesman once again wasn’t very nice. I think that’s just his personality, but still. I’m here, trying to spend my hard-earned money and I would like to be treated with a little respect. Please don’t look at me and think I’m young and naive. I’ve done my homework. I’ve looked up fair market value, annual gas costs, depreciation, reviews and more. I know what I want and I know what I don’t want. I also know what I’m willing to pay and what I’m not. I won’t be suckered by fabrications or extras like bluetooth. If you want me to spend money in your dealership, which I’m fairly sure also ensures money in your pocket through commission, act like it. Be nice, be courteous and be respectful. You aren’t just representing yourself or your dealership, but also the brand as a whole. As the result of my experience, I’m completely over the Ford Escape. It’s nothing special inside and I don’t support ageists. You tell them!!! And when you get that fabulous new vehicle, drive right into that lot and give that salesman the Pretty Woman treatment!